I probably should have written this review before I read the second book, Clockwork Prince...and then I forgot I hadn't! Oops. Anyway, if you have my reviews for any of Cassandra Clare's books, you know that I am OBSESSED. I love her characters and her story lines are always the bomb. Yes, I used the bomb. There are no other words to explain how fantastic her books are. So this series was really different for CC. 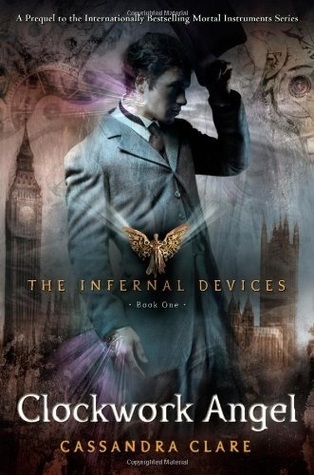 The "normal" Shadowhunter books, The Mortal Instruments, are set in modern day (2007), and the Infernal Devices takes a spin on the Shadowhunter world. The ID spinoff/prequel series is set a century before Jace and Clary are introduced. At first, I was extremely skeptical about the characters in the prequel, just because Jace, Clary, and all of the others are what really makes the TMI series amazing. However, I was hesitant for absolutely no reason. Will rivals Jace. I'm still Team Jace, but I have a spot in my heart dedicated to Will Herondale. Yes, he is a Herondale. Explains the attraction, right? What I also loved about the book was the faint ties between the two series. You could read them separately, but they really compliment each other nicely.